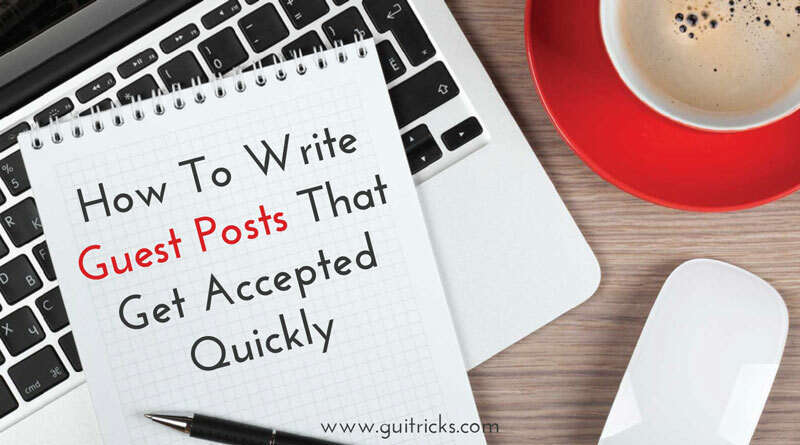 How To Write Guest Posts That Get Accepted Quickly | GUI Tricks - In Touch With Tomorrow! How To Write Guest Posts That Get Accepted Quickly - GUI Tricks - In Touch With Tomorrow! This is one of the most questions that I encounter on daily basis, “How do I get my guest post approved and accepted?”. If you have a website and you don’t know anything about the guest blogging then, believe me, you’re missing a whole lot of opportunities that can boost your sales to the extent you haven’t imagined yet. All the blogger elites make use of the guest blog tricks, that helps them to build their name in the business. Now, they are helping other emerging bloggers that are working hard to build their own names in this digital realm. If you play your cards right then, you can be that elite blogger. Getting the Guest blogs accepted in no easy and simple process. You need to be ready for everything, research, patience, finesse, and diligence. The total summary is getting guest posts approved is no easy process at all. In this post, I will make that process easy for you by all means necessary. All you need to do is stay with me and focus on the things I ask you to focus. By the end of this post, you will see it yourself that your concept about this approval game has cleared. Now, as you get your guest post request approved, now it is time to start planning your post. Basically, when you write a guest post, you get a link back to your website or blog. Now, here the amateurs misunderstand that the only thing that matters is that link. The thing that you need to understand is linking is beneficial only if it is relevant. If you link it to your homepage, where there is no relevancy or lesser one, then the visitor will have no other option but to leave the website, which will increase your website’s bounce rate. So, The first thing to do when writing the guest blog is to relate the article to some information and then link it to a relevant link on your website, not just the homepage. If the reader wants to visit your homepage, he will eventually. But before that just make sure that we get all the reasons to visit and bookmark your website. Mentioning big bloggers may not be as that helpful when you write on your own website. However, if you are guest posting, then the scenario changes another way around. When you mention a big blogger in your guest post, then you actually associate yourself with them and their big audience. This gives you authenticity and a level of authority over your audience. This type of professional linking brings your post the harmony you are seeking for. This will place your guest post in the place among the good blogs. In addition to that, you need to either drop a handy email or just a tweet in Twitter to harness the power of their awesome contact list. You might also see a mention in their Twitter account about your guest blog. That is the exact motive of all that. We all know what anchor text is!!! It is a text used to use the link. The choice of your anchor text is very crucial. In order to get the acceptance of your guest post, you need to have a good anchor text strategy. This is the only way you can get your guest post approved for posting. All the guest blog platforms seek for high-value SEO, that is the sole reason they accept the guest post. Give them the reason that your post will serve that purpose. Now you can consider a scenario such as you write a post about SEO in 10 years. Now here you need to strategize your anchor text so that you can link it further in future updates as well. So, that is why it is important. You must understand that a reader on the internet doesn't just read a full article, they scan. So, help them scan your article that will probe them to read it entirely. Add some meaningful and relevant images and videos that can appeal the viewer to go through your post entirely. Give your post some of the features that can make use of some moderators that must adore your post. The guest post mustn’t look like just a piece of content. Make use of all kind of media to make it interesting, entertaining and informative, all at the same time. Present some graphs, tables, facts, and figures to make it informative. The Guest blog platforms tend to reject the article if they are just a monotonous piece of content. So, don’t give them any reason like that and get your post posted with generosity you seek. People always look for something more. Something extraordinary that is unique. Get some unique information and surprise your moderator of your submission site. Here the extraordinary things are research data, or stats or anything that will give your viewer a new point of view. You must also use some focused keywords, some internal linking, and some proper subheadings using the keyword. Recommend some other post on the same website and do some internal linking. Add some unique topic to the core title by some research. Take a survey and mention that in the post. This way you will be able to create a unique post that will be valued and loved by most of the contribution sites. Try out these tips and share the outcome via comments. Did I miss something? Point me via comments and I will keep those things in track. I hope you do like my post. Please do share it to spread the word. Looking forward to your awesome comment. Till then, have a good one. Lauren McLaren was born and raised in Australia. She is working for Digital Muscle, providing affordable SEO services in Sydney. She’s hardworking, competent and trustworthy. Her role within the company is to design websites. In her spare time, she loves to read, cook and watch movies. which topic is best for guest post ? It depends on your writing skills. All those topics are best in which you can create quality contents.